Summer is the season for outdoor grilling parties and creamy Paleo ice cream. 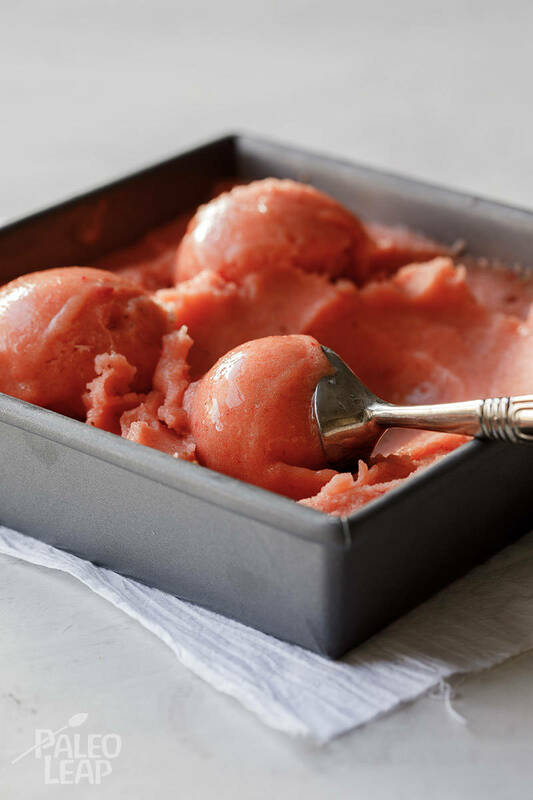 Making your own grain-free and dairy-free desserts can be a daunting task, especially when you are new to the Paleo way of life, but this mango and strawberry sorbet is so simple, there is no way to go wrong. While it is a great recipe for beginners, it is also for advanced cooks who like to experiment in the kitchen – perhaps adding a few fresh mint leaves? A sorbet is pure frozen delight, containing just fruit and sugar, while a sherbet is halfway between sorbet and ice cream (it contains a bit of dairy to make it smoother). Mangoes are sometimes referred to as “the king of fruits” and for good reason: they are an excellent source of fiber and B6, abundant in vitamin C, and chock full of antioxidants. Mangoes are also rich in beta-carotene. A long list of nutritional information can be offered, but let your taste buds decide if it is good for you. We know they will shout – yes! If you prefer your sorbet a wee bit creamier, think sherbet, add just a dash of coconut or almond milk and let the flavors meld together. And if bananas are your thing, this Paleo banana ice cream will certainly hit your sweet spot. We can’t help but think, that bananas and strawberries go so well together, so if you whip up a batch of both flavors, you can have a scoop of each and freeze the rest for later. Later today? Combine the frozen mango and strawberries in the bowl of a food processor with the honey and water (start with 1/2 cup and add more if needed). Transfer to a freezer-safe dish and freeze for one hour. Serve, one scoop at a time.